Season pork fillet with salt and pepper. In a pan, heat oil and sear pork until brown on all sides. Transfer to the oven and roast for 7 minutes (or cooked to your liking). Rest fillet for 5 minutes. In another saucepan, melt butter then add papaya, lime juice and honey. Allow to simmer for 3 minutes. 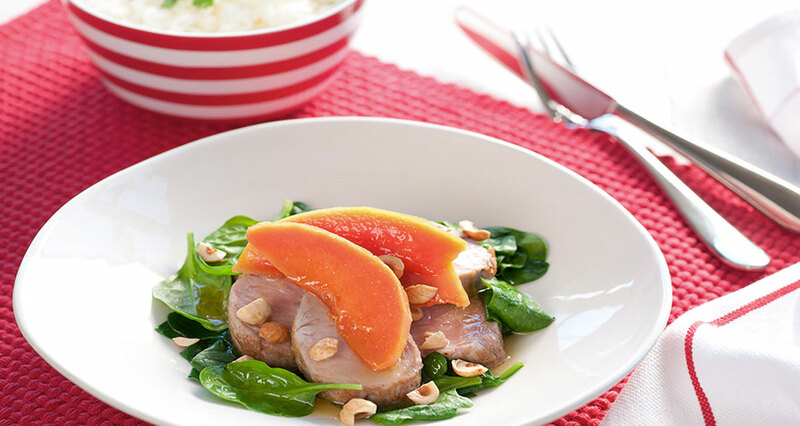 To serve, slice pork fillet and place on a bed of wilted spinach. Pour over papaya dressing and sprinkle with crushed hazelnuts.